Did Brooks Koepka Slim Down For A Magazine Shoot? It’s a question on inquiring minds given that he won two majors last year: why did Brooks Koepka go on a diet? When first mentioned, it sounded like a health matter. But as Eamon Lynch notes in this wrap up of Koepka’s Masters press conference where Koepka revealed the recent end to a 1800-calorie-a-day diet, blood-testing and no gym time has his energy levels coming back. One possible reason for Koepka’s intense effort to get lean: according to reports, the famously buff golfer will appear in the buff in ESPN’s Body Issue, which will be released later this summer. Golfers know the history of the sport has seen players transform their bodies in short time with poor results, but as Brandel Chamblee notes last night on Live From, this one may be unprecedented in sports history given Koepka’s recent form. Michael Bamberger scored the exclusive details of last month’s secret reunion between Matt Kuchar and his Mayakoba Classic-winning fill-in caddie El Tucan to settle any misunderstanding over Moochgate. Not only has he been paid, Ortiz and Kuchar met in a clubhouse dining room in late February, when the Tour went to Mexico City for a World Golf Championship event. Over a 40-minute glass of morning orange juice on Feb. 23, the Saturday of the tournament, each apologized to the other, Ortiz said in a recent phone interview and through an interpreter. How long before Ricky Bobby grows bored with David Leadbetter’s ideas remains to be seen, but the legendary instructor has officially signed up for Team Patrick Reed just two weeks shy of the 2018 Masters champion’s title defense. This may be a Leadbetter first: reporting to the wife of the player he’s coaching. Just to clarify, instructor Kevin Kirk will remain part of Patrick Reed's team and work alongside the Masters champion with David Leadbetter. Leadbetter told Golf Channel that he wasn't aware of Kirk remaining but added, "Whatever makes Patrick the most comfortable." The winner of two majors last year admitted at The Players he is out of sorts after intensifying training and implementing diet restrictions, losing 22 pounds and with it, distance. Alexa Pano, 14, is tied for the lead at -8 heading into the Symetra Tour’s SKYiGOLF Championship’s final round Sunday. Pano is in the field for the upcoming Augusta National Women’s Amateur and has played one LPGA event when she was 11 and in other Symetra events. Still…a 14-year-old with a chance to win on the AAA circuit for Women’s golf? 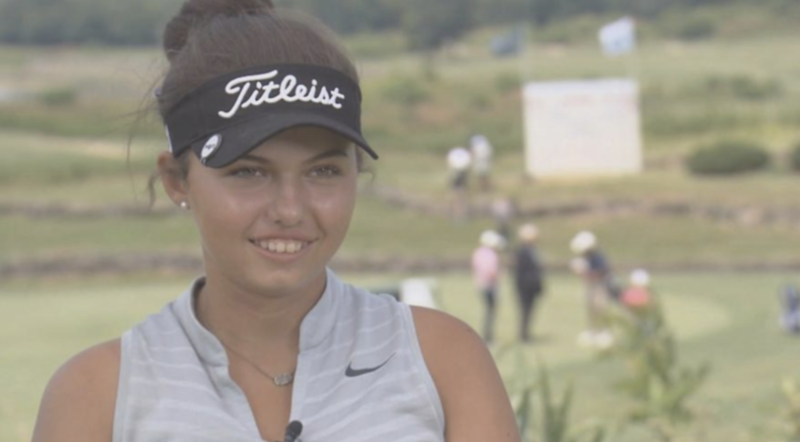 NORTH PORT, Fla. (March 9, 2019) – Asked if she ever expected to be tied for the lead in a professional golf tournament with only 18 holes left to play, 14-year-old amateur Alexa Pano of Lake Worth, Fla., didn’t hesitate to answer. At the inaugural $250,000 SKYiGOLF Championship, Pano is on the brink of history, trying to become the youngest player ever to win a Symetra Tour event. Hannah O’Sullivan, who now plays college golf at Duke, was 16 years old when she won the 2015 Gateway Classic in Arizona. The “youngest” thing is something that the uber-talented Pano has grown accustomed to hearing, though on Saturday at Charlotte Harbor National she said she hadn’t heard it in a while. Justin Thomas after the Honda Classic final round. By my math the two sides should be even. Justin Thomas isn’t so sure. Even though JT has trolled the USGA on Twitter with a "growthegame” hashtag, the organization’s surprise call-out of the former Walker Cupper over his new rules comments appears to have taken him by surprise. And shock. And making a claim that the USGA Tweet was not accurate. “It was a little shocking. It was a little upsetting just because it was inaccurate,” Thomas said Sunday of the USGA’s claims. “I haven’t canceled anything, especially any meetings. But it is what it is, and all I want is the best for the game of golf and the best for the sport, and that’s what we’re going to continue to try to communicate with each other to get that. The full video of Thomas’s post round comments. The USGA’s John Bodenhammer talked to Morning Drive to clarify the organization’s concerns and unlike the Tweet, sounded more concerned about repairing damage and preventing a war of (social media) words. “It’s very clear there is a certain level of discomfort with some Tour players, certainly not all, and we are working to address that with certain rules,” Bodenhamer said. “We know we have more work to do. On Golf Central, both Mark Rolfing and David Duval took issue with the USGA’s tactics though the outcome of more refined dialogue and maybe an end to some of the more excessive new rules commentary. Golfweek’s Dan Kilbridge on Brooks Koepka admitting that he’s been holding back. But now, armed with three of the last seven majors, says he won’t be holding back. Koepka was asked about it earlier this week and basically said we were getting a lot of Brooks Lite in previous media sessions. Now the back-to-back U.S. Open champ feels more comfortable bringing it in full. There goes his millennial street cred! Actually, the forward-thinking world No. 5 is trying to better teach his brain to be calm, focused and stress-free. Clearly his DVD player was off last week or maybe he got bogged down working through studio screeners—it is LA where no one in the industry pays to see a nominee—but as Mike McAllister details for PGATour.com, DeChambeau is normally on the cutting edge of brain-training work. Using his travel-sized Neuropeak Pro brain-training unit, DeChambeau pops in the DVD, then attaches a gold-plated silver EEG sensor to his head. The real-time data he receives monitors the peaks and valleys of his brain’s electrical current as the movie unfolds. DeChambeau’s goal is to avoid the spikes that occur at the most stressful, intense parts; he wants to keep his high beta and theta ratios inside a pre-determined range. If the activity in his brain fires too high, the movie will immediately stop. Only when DeChambeau relaxes his brain – controlling his breathing, reducing his heart rate, focusing his mind to reach a calm state -- will the movie resume playing. Maintaining a proper balance between the parasympathetic and sympathetic states, flattening out his EEG reading to eliminate the highs and lows – that’s the end game. I wonder how many kids will be sending this story to parents suggesting they need a Neuropeak Pro system and Amazon gift card in their lives? Kuchar Digs In: It's A Social Media Issue, Won't Lose Sleep And Even Throws Steiny Under The Bus For Trying To Mop Up His Mess! Matt Kuchar spoke to GolfChannel.com’s Will Gray Wednesday at the Genesis Open and FedExCup leader, all-time leading money winner without a major who won last fall’s Mayakoaba event after a four-year winless drought with his “lucky charm” local caddie, is digging in. Kuchar confirmed he paid “El Tucan” $5000 and the Golf.com report that his agent has since offered an additional $15,000 refused by Ortiz. And he’s not happy about that either. But more on that momentarily. The graciousness ended fairly quicklky in the chat with Gray. “I kind of feel like unfortunately some other people have got it in his head that he’s deserving something different than what we agreed upon,” Kuchar said. He’s certainly correct that he paid $1000 more than they agreed upon, but given that it was Kuchar’s first win in __ years and that a winner’s bonus usually comes with the PGA Tour territory, he’s been blasted for not paying more. Good to see he learns from his mistakes!. And that he has shrewd sounding boards all around! “It’s done. Listen, I feel like I was fair and good,” he said. “You can’t make everybody happy. You’re not going to buy people’s ability to be OK with you, and this seems to be a social media issue more than anything. I think it shouldn’t be, knowing that there was a complete, agreed-upon deal that not only did I meet but exceeded. “So I certainly don’t lose sleep over this. This is something that I’m quite happy with, and I was really happy for him to have a great week and make a good sum of money. Making $5,000 is a great week." Glad he’s not losing sleep. But in digging in, he’s certainly losing fans and at some point, endorsement income built on a “good guy” image. Another interview with Golf.com’s Michael Bamberger comes off even worse, suggesting “someone got in his ear”, referring to El Tucan, and says the attempt to make a payment was the idea of his agent. But he didn’t exactly approve of the idea. Kuchar seemed slightly embarrassed that the additional sum had been offered, as he felt his financial obligation to Ortiz was complete. Asked how it came to be that the additional sum was offered, Kuchar said, “That was the agency.” He was referring to Excel Sports Management, which represents him. Kuchar’s agent there is Mark Steinberg, who also represents Tiger Woods and Justin Rose. Kuchar smiled and said, “It’s not coming out of Steinberg’s pocket.” In other words, Kuchar would be paying. He said the additional proffered payment was Steinberg’s effort at damage control. Given that when you start typing Matt Kuchar into the Google Machine “Matt Kuchar El Tucan” pops up, the issue will, fairly or not, define his career. We all certainly wish the best for anyone in the sport receiving bad news in the middle of a tournament, though nearly two weeks after a bunker meltdown and on-course vandalism of five-greens, Sergio Garcia tells Golf Channel’s Todd Lewis that there was more to his rough week in Saudi Arabia. “I received some very emotional, personal news earlier that week that didn’t help. It was in the back of my mind. As I became frustrated on the course everything erupted,” Garcia told Golf Channel’s Todd Lewis on Wednesday ahead of the Genesis Open. “It was a mix of some emotional and personal things going on and a little frustration with the greens,” said Garcia, who also issued an apology on Tuesday via social media. The full interview aired on Golf Central and will be posted online. AP’s Doug Ferguson also talked to Garcia and several of his peers. Garcia admitted he agreed with Brooks Koepka’s recent assessment and also took hits from Rory McIlroy and Adam Scott. "It doesn't matter where you're from. It's not acceptable," McIlroy said. "If you've got stuff bothering you, let the course be your sanctuary. I've had to deal with that in the past." Sergio: "I’m focused on working hard to channel that emotion the correct way and to be the best me"
In anticipation of his 2019 PGA Tour debut, Sergio Garcia has posted an apology for his actions in Saudi Arabia, that included a bunker tantrum for the ages and vandalism to the Royal Greens course, leading to disqualification. Happy to be in my first @pgatour event of the season and have my brother on the bag again this year. I’ve obviously had some time to reflect, and want to again say I’m sorry to my fans and fellow competitors. What happened is not an example I want to set, and it's not who I truly am. I am an emotional player and while I believe that's one of my biggest strengths, it's also one of my biggest flaws. I’m focused on working hard to channel that emotion the correct way and to be the best me, learn from it and move forward. Thanks for all the support. Sir Nick: Sergio Like Those Galapagos Island Turtles, "Sand Everywhere"
Tony Jimenez with a Daily Express story after talking with English great and former Ryder Cup captain Tony Jacklin about Sergio Garcia’s antics last week in Saudi Arabia. “It was worthy of more than disqualification. I’d have banned him. Damaging greens on a golf course is an offence that deserves a suspension. “The European Tour have said the incident is over and it’s time to move on. Well, if he’s not going to be banned, then I’d like to see him take a self-imposed break from the game. “I think he needs time to realise how fortunate he is, at 39, to have everything money can buy, a young family and everything to be grateful for,” said Jacklin, the most successful captain in European Ryder Cup history and winner of the 1969 Open and 1970 US Open. He will and the European Tour will not discourage it even if time off is in Garcia’s best interest. To recap, Garcia vandalized greens, leaving damage behind for other players to deal with. He threw a bunker hissy fit for the ages over a bad rake job the day prior. European Tour Chief Keith Pelley says the matter is closed. Garcia is set to play in Los Angeles next week. The Fisherman Is Ready For His Monterey Peninsula Debut! Choi’s already got a logo, a following, haters and who knows what else. But the 45-year-old has no plans to change his swing, writes Steve DiMeglio. Shoot, maybe by Saturday Peter Kostis will even have seen him swing and might have his first humorous observation since the mid-90s when Frank Chirkinian fed him a line! While some pretty big PGA Tour names have arrived and some intriguing pro-am names are in town too, Choi adds a grace levity that will undoubtedly be squashed when Bill Murray comes into camera view. Brooks On Sergio's Meltdown: “To act like a child out there is not cool." As the European Tour shields Sergio Garcia from the punishment he deserves for vandalizing the field of play a day after a childish bunker tantrum (also to damage playing surfaces he found improperly groomed to his standards), he’s been called out by last year’s two-time major winner Brooks Koepka. Appearing on the Playing Through podcast, worth a listen to hear the full context and all of his comments, the disdain in Koepka’s voice as well as his defense of course conditions only reinforces just how desperately Garcia needs time off. Matt Adams and I discussed where Garcia’s antics fall in the pantheon of scandalous on-field acts during today’s Golf Central Alternate Shot (middle topic). Paspalum Dynasty: Players Acknowledge Sergio's "Not Normal" "Tantrum"
Brian Keogh unearths additional details for The Independent and in a separate piece, offers a very PG-rated translation of Sergio Garcia’s rantings from the Royal Greens bunker. There was an apology told to Spanish news agency EFE “shortly after his disqualification” reports Keogh. “What happened this week is not something I am proud of,” Garcia told the Spanish news agency EFE shortly after his disqualification. So there is a chance you could make a mistake on top of the mistake you’ve already made if you don’t learn from this mistake. Got it. Of more interest are the details filling in names of some players and caddies who turned Garcia in for vandalizing Royal Greens’ “Paspalum Dynasty” greens on top of names like Robert Rock and Patrick Reed who already acknowledged they saw the Spaniard’s efforts to deface the greens. His antics in round three included leaving scuff marks and a divot on five greens as he played alongside the young Italian Renato Paratore, whose caddie felt Garcia’s tantrum was excessively prolonged. Compatriot Jorge Campillo and his caddie Borja Simo, who were two groups behind Garcia and Paratore, called rules officials when they spotted deliberate damage to several greens. “We knew it could affect us and the groups behind us,” Simo told EFE. At the end of the round, tournament director David Phillips was waiting for Garcia, armed with an electronic tablet and showed him the photos. So we have more confirmation that the European Tour has a file documenting the damage but it seems the chances are slim we’ll ever see them. As we begin a week of discussion about the Rules of Golf and professionals declare how they need to make their own rules, just consider what took place with Sergio Garcia in Saudi Arabia. At least in the European Tour’s case, I’m not sure they are the best judges of their players. To review, Garcia is turned in by his peers for intentionally vandalizing greens at Royal Greens in the inaugural event where the tournament host likely ordered a journalist’s murder and dismemberment. There were no fans on site and few media, so the antics could only be noticed by his peers. The Scotsman’s Martin Dempster quoted a few of the witnesses who, amazingly, chalk the behavior up to a mistake even as they watched a player vandalize the playing surfaces. While no video has surfaced of Garcia dragging his feet, Dempster posted this image shared with him of Garcia having taken a divot out of a green. Conduct unbecoming, needless to say. As I noted here, Garcia needs a long suspension. He previously took a six month break from the game and it did wonders for his attitude. A longer break would serve him and the game well at this point. That Keith Pelley is unwilling to recognize this in an obvious effort to protect a star is both sad and irresponsible. Ultimately the European Tour’s credibility hinges on a sense that a fair playing field is paramount, as is the upholding of basic etiquette in a sport where sponsors pay handsomely to be associated with the quality sportsmanship so consistently demonstrated by most professional golfers. I’ve quizzed longtime observers and no one can come up with anything in the history of professional golf comparable to Sergio Garcia’s disqualification under Rule 1.2a for purposely damaging the Royal Greens. For a player who lowered the bar when he spit into a Doral cup during the 2007 CA WGC event, the notion of altering the playing field is an entirely different beast. Worse, in his statement he mentions damaging a “couple” of greens, but Martin Dempster, reporting on site for The Scotsman, says it was five greens. James Corrigan also noted the weeklong antics. Struggling at around level par, Garcia’s renowned rage got the better of him as he slammed his club into the putting surfaces on multiple occasions. Observers at the Royal Greens Country Club revealed that he was heard criticisng the greens earlier in the week and on Friday was seen taking out his dislike of the bunkers by smashing down his sand-wedge. The American Patrick Reed was involved as he was in the group immediately behind Garcia that first drew the officials’ attention to the gouges on the greens. The three groups following Reed also complained to the referees and it was then that Tour chief executive, Keith Pelley, confronted Garcia. Sky Sports curiously reserved little attention for this newsworthy situation at the conclusion of their live broadcast, with the 62 produced by China’s Li Haotong deemed worthy of far more coverage. Pelley could have done without these antics by one of his tour’s most high-profile players. The European Tour’s decision to visit Saudi Arabia for the first time has been subject of widespread criticism on the basis of human rights infringements by the country. The dreadful incident is a fitting black eye for a tournament that should not have been played. But beyond the optics, given the weeklong behavior, the career of etiquette breaches and the absurdity of damaging the host course, Garcia should be suspended for the remainder of the 2019 season. The last high-profile pro to be hit with a misconduct charge was Simon Dyson in 2013. The Yorkshireman was disqualified from the BMW Masters and was forced to pay a £30,000 fine and received a two-month suspended ban. Dyson's crime was to tap down a spike mark, an act that was then against the rules, but which is now allowed. Dyson’s act was a selfish, split-second mistake that might have improved the playing surface for himself. Garcia intentionally damaged a host venue and left behind poor conditions for those playing after him. It’s an unprecedented breach that calls for an unprecedented penalty. The southern California native and Oklahoma State standout with the eye-opening swing used a sponsor’s invite opened the Waste Management Phoenix Open with a 68. Cameron Morfit revisits Matthew Wolff’s story for PGATour.com and the swing “issues” he’s faced (translation: others taking issue with an unorthodox move). Known for his clubhead speed, Wolff averaged 328.1 on the measuring holes and 318.9 yards on all holes. Matthew Wolff is -3 thru 14 in his PGA TOUR debut. Koepka On Pace Of Play: “Guys are already so slow it’s kind of embarrassing." Brooks Koepka sat down with Golf Monthly’s Michael Weston in that progressive haven known as Saudi Arabia to discuss various topics for a podcast. Inspired by Bryson DeChambeau’s pace last weekend in Dubai, Koepka expressed a lack of patience for slow pokes. “I just don’t understand how it takes a minute and 20 seconds, a minute and 15 to hit a golf ball; it’s not that hard,” Koepka said. “It’s always between two clubs; there’s a miss short, there’s a miss long. It really drives me nuts especially when it’s a long hitter because you know you’ve got two other guys or at least one guy that’s hitting before you so you can do all your calculations; you should have your numbers. “Obviously if you’re the first guy you might take ten extra seconds, but it doesn’t take that long to hit the ball, especially if it’s not blowing 30. “If it’s blowing 30 I understand taking a minute and taking some extra time with some gusts, you know changing just slightly, I get that but if it’s a calm day there’s no excuse. The full pod is available at the link.